More than 80,000 artifacts that provide a glimpse of life in the region 4,000 years ago have been recovered by archeologists on the banks of the Puce River. 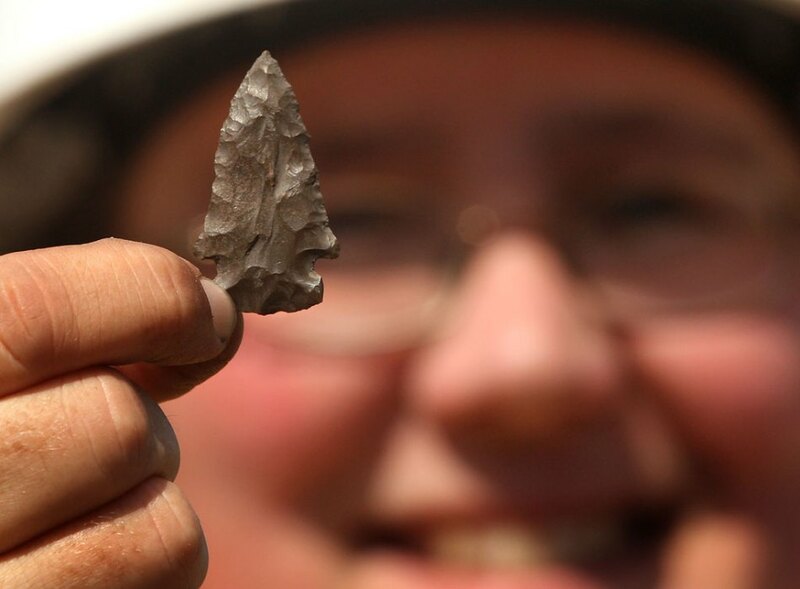 While most of the arrowheads and pieces of pottery found are 1,000 to 1,200 years old, scientists kept digging deeper and eventually came across artifacts that were 4,000 years old, said Jacqueline Fisher, an archeologist hired by the county. The artifacts were discovered during an environmental assessment for the construction of an expanded Puce River bridge on County Road 22. The excavation was done by hand over a one-hectare dig site. Some artifacts were discovered in soil less than a foot deep and Fisher said there was evidence of later Euro-Canadian habitation, including the impression of a wood cabin. 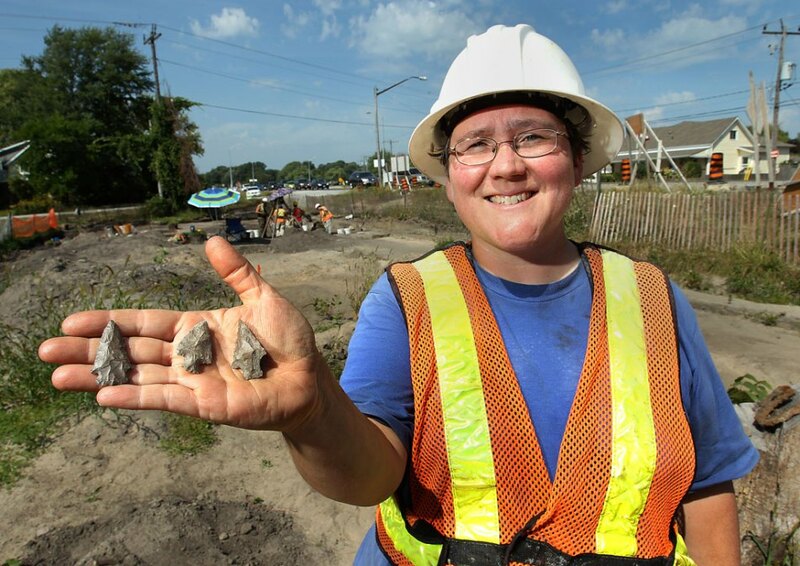 Three members of the Walpole Island First Nation have assisted with the dig. Field director Ruth Macdougall said it wasn’t surprising that the banks of the Puce River were a popular site for camping, fishing and hunting for millennia because the ground is sand, which drains well, while the rest of the county is clay. What makes the Puce River bridge excavation site unique among hundreds of archeological digs done in the world is the earth was undisturbed as if it were frozen in time. Other than the addition of topsoil at some point in the past century, artifacts were discovered underground exactly where First Nations people left them. Usually artifacts are found in disarray in already plowed ground churned for agricultural planting. Weir said he’s never done a dig in Greece, for instance, where the ground wasn’t chewed up. The undisturbed property helps archeologists piece together the First Nations story better, Fisher said. An untouched archeological site is so rare that Fisher has only worked on six of hundreds of projects in her 26-year career. Once the artifacts are brought to a laboratory in Hamilton, Macdougall said she wants to try to piece together one of the broken pots with glue. Scientists also found spearheads, stone drills and stone knives. While all artifacts are owned by the province, there is the possibility of returning some to the community for an exhibit or permanent display, officials said. The dig started in July 2012 and will be finished at the end of this month. It will cost the county an estimated $1.1 million, an expense that is expected to be absorbed into the $11 million budget for the construction of a new three-lane Puce River bridge, the rehabilitation of the old bridge and some road work. This is the biggest archeological dig ever found during a county construction project, county engineer Tom Bateman said. The county and archeologists co-ordinated work so that construction and artifact finding could continue simultaneously. The county expects the new span to open in late spring of 2014 and then the old bridge will be closed and rehabilitated. Eventually the bridge will have five lanes. While the county built some contingency money and possible archeological costs into the budget, they did not anticipate the actual cost.